Wow, my 2018 has been jam packed thus far and I loved every bit of it. This time last year I was a hot mess. I’m still a mess but at least I’ve cooled down some hahahahaha! But I’ve had an amazing birthday month and I have so many people to thank for it! I don’t like to brag but allow me to “big up myself” for just this month! Because it was truly lit from beginning to now! I went into the eve of my birthday month celebrating my favorite Holiday, New Year’s Eve with my forever girls, Jordane and Jennifer by singing, dancing, eating, and sipping into the countdown at Batanga in Downtown Houston. The energy was crazy! The restaurant was filled with so much love, from the servers, to the guests; we all sang and danced together as if we were friends. The cherry on top was indulging in some comfort food at brunch which was hosted by Jordane the morning after. Everything was delicious! Having my friends share their talents on the site as weekly contributors was by far one of the best presents ever! I had this idea for some time and I kept getting the whisper to wait and wait and wait. So I did! To get the confirmation from everyone was so exciting and then to actually see everything come together was truly beautiful. It’s something about having the support of your peers and colleagues that is better than any award or praise from strangers. I truly appreciate each of them more than they know. Okay, so I have been dying to get to Stone’s Throw Cocktail Lounge every since I moved to Houston and I finally got to go, on my actual birthday. Every first Thursday of the month they host a burlesque show and guess what day is was this month? You guessed it, My Birthday. They have the most unique happy hour with drinks priced by the hour, meaning at 4 pm drinks are $4 and increase in price as the hours go by. 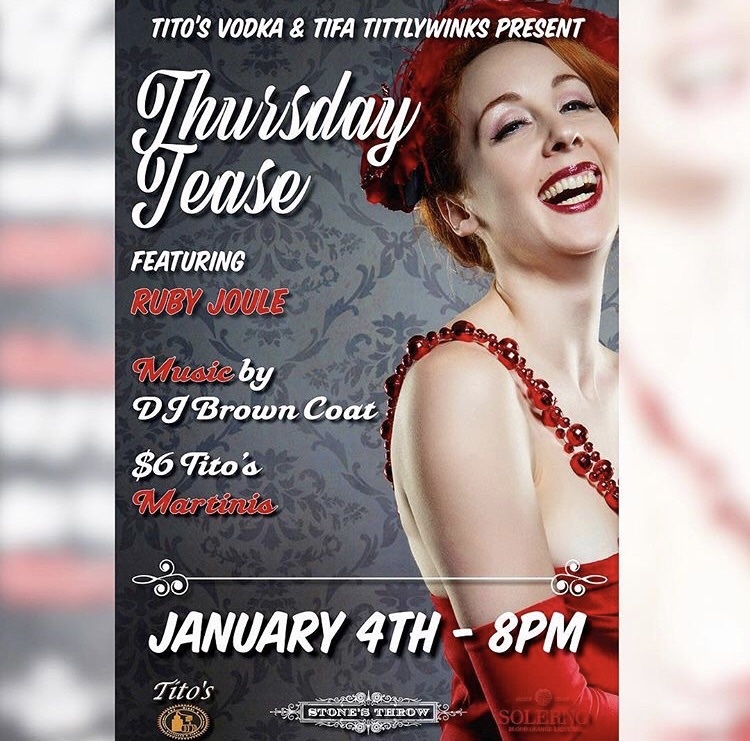 I enjoyed the company of great friends and even better conversation all while sipping drinks like “Daddy Issues” and watching Tifa Tittlywink perform her set! On the day after my birthday, I had plans to get all dolled up and head to the Museum of Fine Arts Houston and bask in the beauty of the Oscar De La Renta Exhibit followed by dinner. But allll day all I could think of is was my B-E-D! I was so damn tired! I napped until I woke from hunger and I loved it. My boyfriend was so understanding and pushed our reservation back and we still had an equally amazing night even though we ditched our plans. I got to try another place on my list, Gringos Mexican Kitchen, and I liked it alot. I’m partial to Tex-mex style restaurants but this one exceeded my expectations! If you didn’t know before, I don’t like clubs. I hate paying to stand up all night just to wait for my song to play. I was was honestly over it at 19 years old. This year for my birthday, I wanted to get weird and embarrassing with...KARAOKE!!! Karaoke is so much fun and I recommend everyone do it at least once in their life. I usually sing my go to songs Call Tyrone by Erykah Badu and Thong Song by Sisqo which kill every time. But this go’round, The Besties and I hit the stage with B2k’s Gots to Be. It felt so nostalgic to sing such a great throwback ith the same girls that I was around when the song came out. We shut the place down! As my brother Kanye said “I got people in high places like Jesus niece”! When your best friend is plugged like mine, you get to go to super exclusive corporates restaurant openings like Willie G’s Seafood. Before they opened to the public, the corporate employees were invited to test out a 3-course dining menu, gratis! Not only that, they get to invite a plus one, which was my part in all this glory! Every dish and drink was delish! It’s safe to say I’ll be back (when I save my coint). Thanks Bestie! Now to be honest, my habits and routines can be an entirely separate article. The way I budget my time is vital to accomplishing my goals and making time for fun. Each hour counts. From reading for 30 minutes a day to recording my meditation sessions, I have adopted some new routines that have help my productivity 1000%. It's only the beginning but I plan to keep making every month of this year as fun and productive as my Birthday Month!